Keep in mind as well that what is “normal” for your dog and someone else’s may be two different things. So, just because the neighbor’s dog may have a loose stool and yours does not, may simply mean they’re being fed a grain based diet that produces large amounts of loose stool, while yours is being fed a high end holistic brand that does not produce copious quantities of loose stool. What we’re aiming to provide you with is a guideline to dog bowel movement problems that really “are” a problem and need vet treatment. Constipation is a dog bowel movement condition that means it’s difficult for your dog to pass a stool. S/he may pass stools infrequently; have incomplete bowel movements or a hard time passing dry and/or hard feces. The term constipation is sometimes used interchangeably with “obstipation,” which means the dog can’t pass stools at all; a horribly painful condition that causes the dog a lot of stress. Check list of medications dog is taking. Discontinue those that may cause constipation. Warm soap and water enemas. OTC enemas may be toxic. Teach owner how to palpate dog’s colon abdominally to prevent constipation from becoming obstipation. Natural remedy formulated for restoring dog bowel movement function such as Natural Moves. This product contains Psyllium Husk, which is a source of dietary fiber used to restore normal dog bowel function. When a dogs eats a stool, it can result in a dog bowel movement problem called dog coprophagia. Dog stool eating is a problem as it could introduce parasites into the body, not to mention causing symptoms such as vomiting and diarrhea. Diarrhea is the most common dog bowel movement complaint owners have when they take an ill dog to see the vet. Most people are familiar with what diarrhea means, and so we won’t define it for you, but suffice it to say that it’s feces that moves fast through the dog’s digestive tract, which means they don’t absorb the proper electrolytes, nutrients and water. Some dog bowel movements may have mucus or fresh blood in them. If this persists for three weeks or more, it is referred to as chronic diarrhea. If you have a small dog with diarrhea, do not wait any longer than two days to see the vet. It’s too dangerous for them, as they dehydrate quickly. Persistent diarrhea leads to weight loss, loss of appetite, loss of body condition, apathy, lethargy, depression, poor skin/coat condition and a decrease in their usual activities. Dog bowel movement problems that result in diarrhea are usually the result of problems in either the large intestine or the small intestine. Treatment will vary based on which part of the intestine is causing the problem. Dogs that are suffering from diarrhea caused by problems in the small intestine often lose weight due to a loss of nutrient absorption. They may also suffer from edema (fluid accumulation in the belly or legs). Treatment often includes withholding of food for 1 to 2 days (not water), followed by a bland diet for several days such as chicken and rice. This type of dog diarrhea can be caused by parasites such as whipworms, polyps in the intestine, IBD (inflammatory bowel disease), ulcers or cancer in the colon. 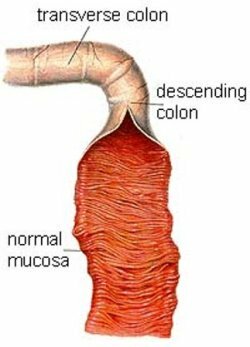 Treatment depends on the identified cause and often includes the addition of fiber to the diet and the medication sulfasalazine for intestinal inflammation. Source: The pictures in this section are reprinted with permission by the copyright owner, Hill's Pet Nutrition, from the Atlas of Veterinary Clinical Anatomy. These illustrations should not be downloaded, printed or copied except for personal, non-commercial use. A diarrhea dog bowel movement related diagnosis will be initially based on a veterinarian's review of your dogs diet and environment. Possible upper GI series to rule in or out the involvement of foreign bodies, obstructions, tumors, organ displacement etc. Exploratory surgery if tests inconclusive or suspected disease may need surgical intervention. Diet change to high fiber for large bowel diarrhea. Diet choices include Hill's z/d. Diet change to hypoallergenic for small bowel diarrhea such as Purina h/a. If the diarrhea is sudden (acute), then food will be withheld from the dog for 1 to 2 days. The dog can still have water. Bland food such as chicken and rice are provided 3x to 6x times per day for several days, gradually increasing the amount of dog food given. As the dog recovers, a dog should be slowly reintroduced to the normal diet by reducing the percentage of the bland diet and replacing it with the regular diet. A homeopathic remedy such as Runipoo Relief can also help to speed recovery by helping the body form firm stools and restore the health of the gastrointestinal system. Dogs are always swallowing different objects. Unfortunately, dogs are capable of swallowing objects that are larger than what they can pass through the stomach. Surgery is used to remove objects that cannot pass naturally through the body. Certain foods, or a dog that takes in too much air when eating can cause a dog to have gas. It is also a symptoms that is associated with food malabsorbtion. Treatment involves reviewing the causes listed above and dietary change to a food such as Hill's i/d. Eosinophilic Enterocolitis: Very uncommon problem caused by either food allergy or a worm. The condition is treated with corticosteroids and a change to a hypoallergenic dog food. Granulomatous Enteritis: This uncommon disease is caused by inflammation in the small bowel. Symptoms include bloody dog diarrhea. Treatment is with corticosteroids and immunosuppressive medications and metronidazole. Surgery may also be required. Neutrophilic Entercolitis: This form of canine IBD starts suddenly in the large bowel. Treatment is with corticosteroids and antibiotics. Histiocytic Ulcerative Canine Colitis: This condition occurs in the Boxer breed when the dog is under 2 years of age. Symptoms of canine Histiocytic ulcerative colitis include diarrhea with blood and mucus. Treatment includes dietary change and medications if necessary. Idiopathic villus atrophy: This is a small intestinal disease (primarily found in German Shepherds) where the small bowel is not absorbing food and liquids correctly. Small Intestinal Bacterial Overgrowth: When diarrhea has a bad smell, this can be the cause, where the flora of the small intestine in not at normal levels. It can be triggered by pancreatic problems (pancreatic insufficiency), IBD, or an aftereffect of dog bowel surgery. Treatment can include a switch to gluten free dog food and antibiotics. Canine Lymphocytic-Plasmacytic Enterocolitis: this type of bowel disease is triggered by dog giardia, bacterial overgrowth, food allergy. Symptoms are commonly vomiting and diarrhea. Treatment involves dietary change. This refers to anything that blocks normal dog bowel movement function, usually a foreign object. Other causes include tumors, or a problem where the bowel folds on itself (called canine intussusception). If the bowel is completely obstructed a dog will experience continuous vomiting. If the dog bowel problem is a partial obstruction, then symptoms include diarrhea that is possibly accompanied by occasional vomiting. A canine bowel obstruction is treated with surgery to correct the identified problem. Eating a dog stool could be a bad habit formed when a dog is a puppy, requiring behavioral modification/training. If a dog is suffering from malabsorption, then to meet the increased appetite levels demanded by the body, a dog might eat anything in sight including a dog eating stool. Treatment involves cleaning stools quickly, or making the dog stools less appetizing with an additive such as Forbid or Potty Mouth. 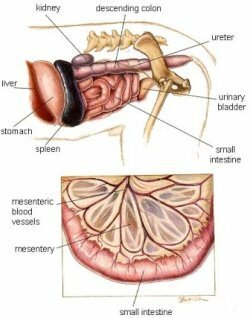 Peritonitis: This is the part of the body that holds the abdominal organs. When an organ in the body is leaking, the fluid can accumulate in this cavity causing canine peritonitis. There are many possible causes for this condition that causes blood, urine, food or digestive enzymes to enter this cavity. Symptoms include labored breathing, rapid breathing, severe abdominal pain when touched, a hardening of the abdomen and vomiting. If you suspect canine peritonitis, call your veterinarian immediately. Canine peritonitis is an immediate medical emergency, requiring emergency surgery to repair the rupture.